Paintballing is a great activity to do during your Hen Weekend. You will be provided with camouflaged overalls, protective head gear and semi-automatic paintball guns and will be running about the woods splatting people with paintballs. Our Edinburgh Paintball site is one of the best in Scotland and we guarantee you an adrenaline fuelled, paint splatting experience with many different game zones to choose from including The Compound, the Bridge Gate, No Man's Land, Bunker Hill, Brave Heart and Assassination. The guys at our Edinburgh Paintball site have created the perfect Paintballing experience and we guarantee that this activity will leave you tingling with excitement for the rest of the weekend! 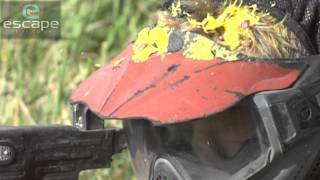 View our Paintballing video and get an idea of what to expect on this activity.